What does the Nyberg Report say about the media? 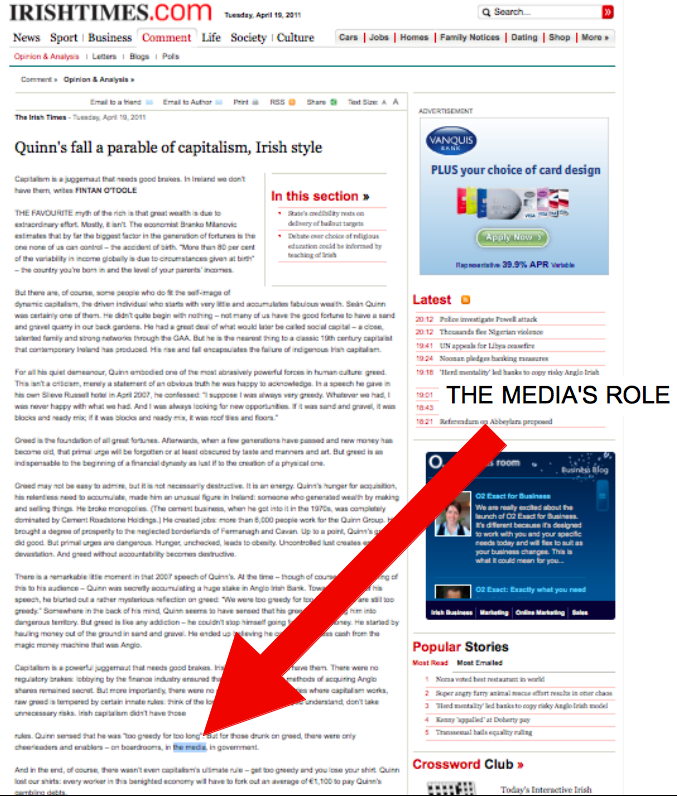 An email to the Irish Times’ Fintan O’Toole regarding the recently published report on Ireland’s financial crisis. I’ve just scanned the Nyberg Report and wanted to ask whether you are planning to write anything about what this report says about the media’s role in the economic crisis? Adding a little depth to the single sentence mention you gave it in your last piece on Sean Quinn. Here’s a few choice quotes from the report that would be a great basis for a long over due bit of soul searching about journalism. Fisk has done it for war reporting, it’s about time someone did it for economics reporting. You can watch the full debate here, or digest the summary below in a matter of second.